How dangerous is chemotherapy? Is it possible that in some patients, chemotherapy actually cuts the patient’s life shorter? And if so, can we identify those at risk? A recent study published in the British medical journal Lancet has some answers to these questions. The researchers looked at 23,228 women with breast cancer and 9,634 men and women with small cell lung cancer. All of the patients were started on a cycle of chemotherapy. Then, the researchers looked at those who died within 30 days of finishing the chemo. The reason is that the most likely cause of dying right after a course of chemo is the chemo, not the cancer. And they wanted to determine how often this happened. Here’s what they discovered. First of all, they looked at each case and determined whether or not the cause of the death was the cancer, the chemo, or a non-related factor. When they looked at the cases where the chemo was at fault, they found that the likelihood of dying from the chemo was increased when higher doses of chemo were used. This shows a dose-responsive relationship. And, as I’ve pointed out in the past, anytime there is a dose-responsive relationship between a drug and a result, the drug is the responsible agent. So yes, in some cases, the patient was killed by the treatment, not the cancer. The next thing that they wanted to look at was whether or not certain patients were more at risk of dying from chemo than others. And, not surprisingly, they found that a good predictor of who was likely to die from the chemo was how good a shape the patient was in when they started the treatment. So, what’s the take away lesson from this rather obvious study? The take home message for me is that while it’s obvious that chemo can kill, it’s the overall condition of the patient that determines the risk. The patients who are in the best shape are the ones who are most likely to be able to resist the toxicity of the drugs. Doesn’t it make all the sense in the world for any patient getting chemo to be in the best possible shape they can be in? That means paying close attention to diet, rest, exercise, supplements, and detoxification for at least three to four weeks before starting the chemo. And here’s why this is so important. (1) Cancers take a toll. By the time a cancer has been diagnosed, in most cases, the patient is already nutritionally deficient, underweight, over inflamed, over oxidized, toxic, stressed out, and in overall poor condition. To take such a person and immediately inject toxic, potentially lethal drugs into their system with no preparation makes no sense at all. (2) Cancers, even though they may have just recently been diagnosed, have already been present in the body for many months or years. The growth of any cancer will be minimal in three to four weeks. They just don’t grow that fast. A three to four week delay in treatment is not going to decrease the efficacy of the treatment. The fact is that a preparatory period will only serve to improve the efficacy of the treatment, while at the same time decreasing the side effects. In most cases, there’s plenty of time to prepare. (3) The exception to the above would be a cancer that is potentially blocking off a vital structure or eroding into blood vessel and causing a sudden bleed. This is a rare circumstance, but it can occur, and it’s the only time immediate treatment is needed. So, if you suddenly learn that you have cancer, even though the natural impulse is to immediately attack it, resist that impulse. Take your time and prepare yourself. This will cause the treatments to be less toxic and have fewer side effects. It will also cause the treatments to be more effective, and, of course, less likely to kill you. And there’s one other thing I routinely do in addition to the other pretreatment strategies I mentioned above. It’s such a shame that so many patients being treated with chemotherapy for cancer are denied ozone therapy. It’s only out of ignorance. Ozone therapy not only increases the efficacy of both chemotherapy and radiation therapy, it also significantly decreases the side effects. For over 35 years now, I’ve been giving regular ozone therapy to my patients while they get chemotherapy. I use the technique called major-autohemotherapy (MAH), in which blood is removed into a bag or bottle, treated with ozone, and then immediately reinfused. This technique was developed way back in 1961 by Dr. Hans Wolf. And it’s still the state-of-the-art technique used to this day. At the end of their treatments, their oncologists inevitably tells them that they responded better and had fewer side effects than their other patients who go ozone free. One reason for their success is that the ozone preconditions the patient, helping them be in the best possible health once chemo starts. Another reason is that ozone can treat any hidden infections present in the patient. These infections might complicate chemotherapy and make the patient more susceptible to death. And, finally, the ozone can help prevent infections from taking hold during the chemotherapy, which is a very common problem. Infection is one of the most common life-threatening complications of cancer and cancer treatment. This is because chemotherapy destroys your immune system, and ozone can help protect you from these invading bugs. As an example, one of the common side effects of chemotherapy is stomatitis. Stomatitis is the ten-dollar word for painful mouth sores. Ozone therapy virtually eliminates this, and several studies verify this. One particular study looked at 114 men and women who had been infected with herpes simplex virus (HSV1) and who were getting chemotherapy. The first thing the researchers discovered was that chemotherapy brought out the virus. Patients who had the virus and were also getting chemotherapy had seven times the amount of virus in their throats than those who were infected with the virus, but who were not getting chemotherapy. That’s not all they found. The researchers also cultured the patients for the virus two to three times per week over a three to four week period. 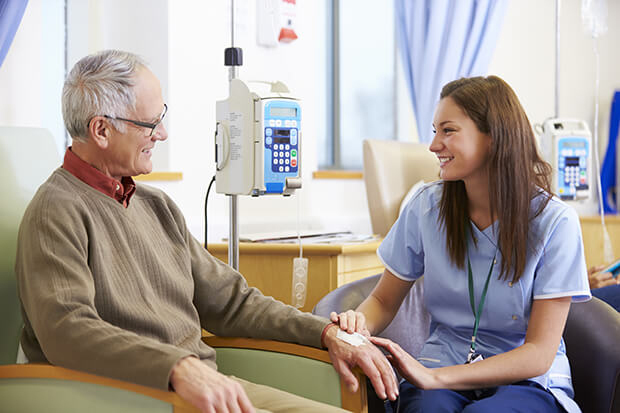 According to the authors, “chemotherapy patients had a strikingly higher incidence of multiple positive cultures” amounting to a greater than 700% increase. Then they looked specifically at those patients who developed stomatitis from their chemotherapy treatments. They found that, “Among chemotherapy patients who developed clinically evident stomatitis, 85.7% had HSV1 recovered compared to 28.6% without lesions.” They concluded that while not all chemotherapy patients developed stomatitis because of herpes virus, the majority of them did. And that’s why ozone therapy is so good at preventing stomatitis. It's because ozone therapy is so good at treating herpes infections. Dr. Heinz Konrad reported on the effectiveness of MAH for herpes infections more than 30 years ago, and I’ve never seen it fail. But herpes isn’t the only virus ozone fights. It will fight any bacterial, viral, and fungal infection you might encounter during chemotherapy. Find a doctor trained in ozone therapy to work with you in the three to four weeks before you start chemo, and also during and after chemo. We get exceptionally good results by adding in MAH ozone therapy followed by intravenous vitamin C and intravenous glutathione twice a week during the pretreatment period, and then once a week during the treatment. You can find doctors trained in ozone therapy at aaot.us.